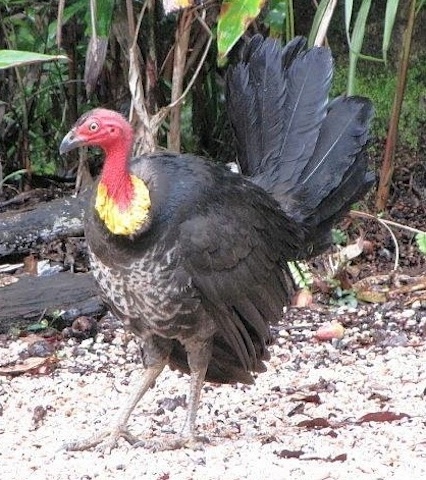 One of the megapodes (meaning big feet), the brush-turkey is a common site of far north Queensland. The male builds an incubating mound of about 4 m in diameter and 1.5 m high. Amazingly, he regulates the temperature of the mound by turning over the leaf and twig debris. He then tests the mound by putting his head in holes he has dug. It is a communal nest where one dominant male and younger males tend to the nest where several females may lay their eggs after which the male covers them up. Up to 50 eggs can be laid in one mound. 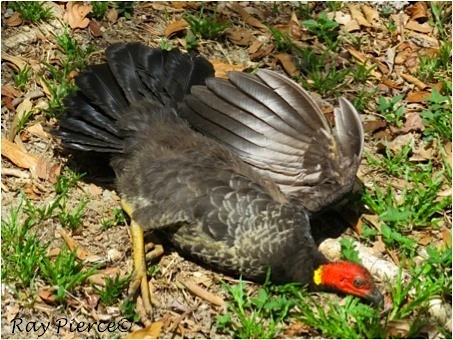 Once the chicks hatch, they are completely on their own but with all-brown feathers they are hard to notice.